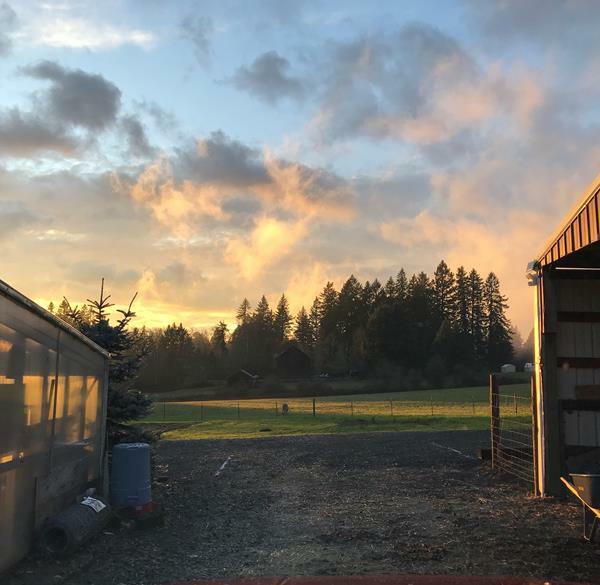 How did the most unsightly part of the farm (that spot between the greenhouse and the hay barn) become our prettiest view today?! ?I love these chilly February days on the farm and in The Kitchen. As our busy holiday season continues to run long into February, I am overwhelmed by gratitude for all of you who continue to spend these afternoons and evenings with us in The Kitchen. You’ve welcomed Chef Andrea with open arms as she brings her expertise to The Kitchen, and you’ve continued to support Chef Kate as she develops into a fantastic instructor. Wait until you see what she is doing in the greenhouse this year as she grows in her role of Chef and Farm Manager. You share our story, laugh at my jokes, and continue to join us at The Kitchen table, sharing another delicious meal! We’ve added plenty of upcoming spring classes to the website, so come back and see us soon! We’ve been sharing our space, and our leftovers, with five little lovelies that you may have met in the pig pen. These pigs are a cross between two heritage breeds – Gloucestershire Old Spot and Large Black. They were chosen for their family friendly demeanor, hardiness to live on pasture, and fantastic flavor as pork. But as they always say, all good things must come to an end. As the farm side of Middleground Farms grows, we are starting to offer shares in our farm raised pork. Loved and well fed, these pigs represent exactly why we do what we do – bring great food to our table, knowing exactly what we are eating. If you are interested in purchasing a half-hog now, or in the future, please send Jessica an email. Speaking of bacon…. Join us for our upcoming Brunch & Bubbles: Lowcountry Brunch class on April 22nd! Register here! If you have littles, you are already making your spring break plans. 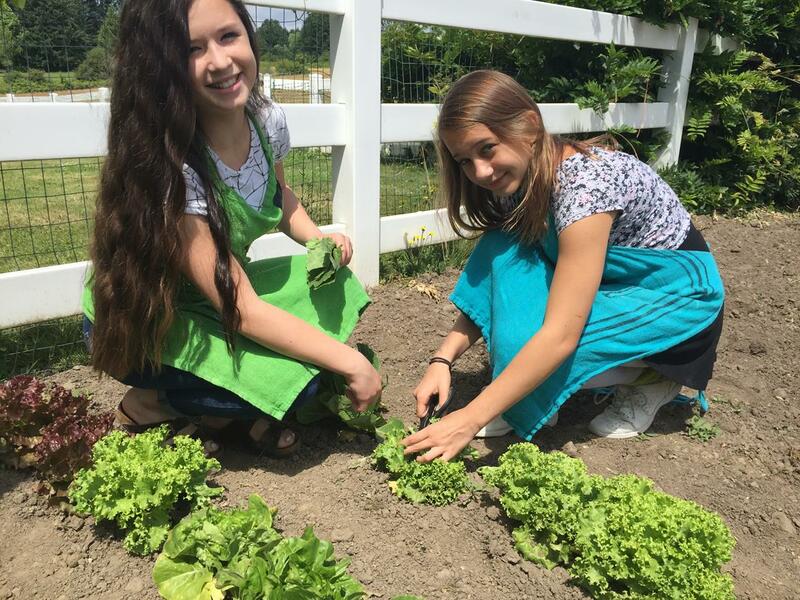 Send your kids to The Kitchen for Kids Camp where they will get a taste of farm life AND will learn to create some delicious meals in The Kitchen! Choose one, two, or three days where they will take something off of your plate by learning to put something on the table for Breakfast, Lunch or Dinner! March is Portland Dining Month! 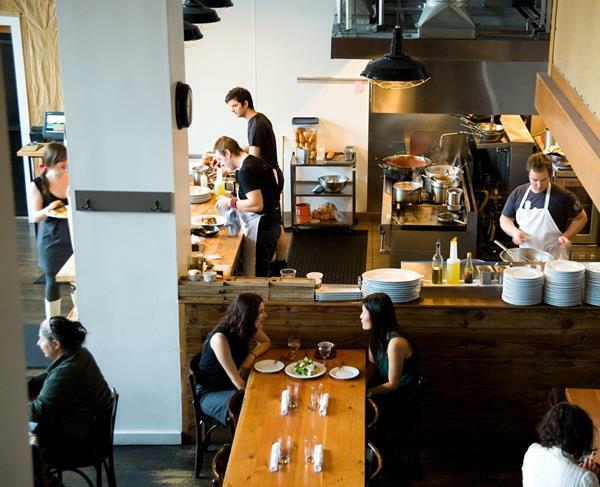 If you aren’t cooking with us in The Kitchen, get inspired by all of the great food that Portland has to offer by supporting these small restaurants. Check out Travel Portland’s Picks for the best places to go! If you don’t have plans for next weekend, February 24th, head to Newberg for the Oregon Chardonnay Celebration. Over 50 of area’s best chardonnays will be poured, while enjoying nibbles from The Allison Inn. One of our favorite’s, Elk Cove Vineyards, will be there – tell them we sent you! Love Kombucha? On Tuesday, February 27th, you won’t to want to miss our Kombucha and Water Kefir Workshop taught by our Kombucha-loving Chef Kate! You’ll head home with a bottle of Kombucha that you flavored yourself and a Kombucha SCOBY so you can start your own home brew. The night culminates with a delicious meal (as always) enjoyed family style around our beautiful barn wood tables! Have you heard of Farmlandia? We are proud to be part of the Farmlandia Farm Loop, a self-guided tour through 20 farms in the Milwaukie, West Linn, and Wilsonville area. This loop includes a variety of farm stops, including farmstands with fruits and vegetables, amazing local wines, and friendly farm animals. One of our favorite neighbors is Pete’s Mountain Vineyard & Winery. They are open every Sunday for tastings from 1-4 pm. It’s a great destination after our Spring Pies & Tarts class at The Kitchen! Was this information helpful? Please share! Roasted Delicata Squash and Kale from KATU’s Afternoon Live! Tomato Gazpacho from KATU’s Afternoon Live! Heirloom Tomato and Goat Cheese Galette from KATU’s Afternoon Live! Summer Greens with Goat Cheese Crouton and Fresh Oregon Berries from KATU’s Afternoon Live! Thanks to our many partners who help make our on-farm experiences happen!